Using the sketch developed in animating regression parts 1 and 2, let's take a look at Anscombe's Quartet. What makes these datasets useful, as wikipedia points out, is their near-equivalent stats: the x and y sets share the same mean, sample variance, correlation and simple linear regression model. It's instructive as a clear example of what to watch out for when developing simple linear regressions, and the issues each dataset highlights come clear in the different diagnostic plots. I'm under several class deadlines just now, so I won't go as far as possible in making this nice and cleanly configurable and modifiable, but I certainly don't want to write the same code out four times, so I'll look for a middle ground that achieves some code cleanup and a modicum of reuse. This can be written to a file for later use, like here. color! highlighting each data point with a color from the color brewer "spectral" should support a viewer's ability to follow any specific observation through the four plots. the JSON output from R I described above was more awkward to work with than a more row- or observation-oriented dataset shape, so there's a quick reshaping step. This results in simple references to the data values. added a 1.1 buffer factor around the input domain for several of the axes to draw the data inside the axis lines. synchronizing the transitions among four different chart instances doesn't seem to have a single obvious solution. you can see them fall out of sync if you want the cycle long enough, and avoiding that might require some sort of clock check or simple communication pattern. even so, the eye can only meaningfully follow one plot at a time, so it doesn't ruin the effect, and if you believe google analytics few readers spend more than one minute per page on this site, so it's not a serious problem here, now. i can see case for pulling the axis resetting back out of the individual plot modes again; it's a little cumbersome to keep reassigning each time. on the other hand, this way all the logic for a plot is self-contained, so it would feel a little cleaner to add more plots to the reel without having to bounce around and keep track of a dozen different scale and axis variables. would be nice to jitter or spread out the residuals so the bars don't overlap like on the fourth dataset. no configuration accessors keeps this from being particularly resuable by anybody else, but that's the other side of that line i drew in going for that middle ground. other homework awaits! several details are hard-coded, like the color scale and the size and styling of different elements. 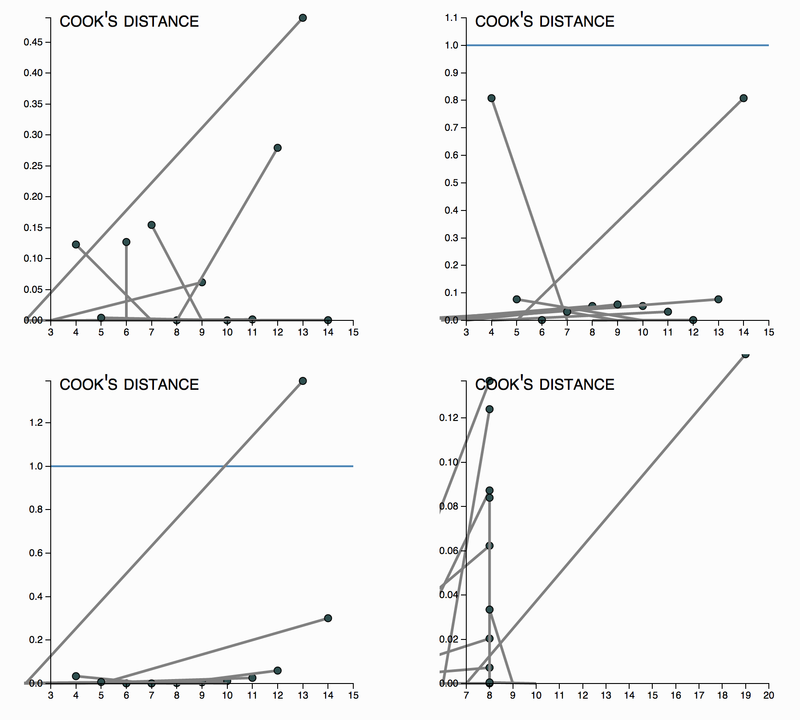 if jstat or simple statistics had a cook's distance function we could take arbitrary datasets and render them all inline, or at least as part of the reusable graph. Always good to have something to work on next.